What does the future look like for Acumatica cloud ERP? Nucleus Research shares their thoughts on the subject in a new report. Acumatica Summit 2019 attracted a record-breaking number of attendees. The audience of over 1,500 customers, partners, and analysts were the first to hear how Acumatica continues to be the fastest growing cloud ERP in the market and how the usability and functionality of the solution is further enhanced in our newest release, Acumatica 2019 R1. Nucleus Research analyst Seth Lippincott was one of the attendees, and he put his thoughts about the Summit and Acumatica’s future into a new report: Acumatica Shows No Signs of Slowing. Nucleus Research provides insights into technology—and its real-world value—through in-depth research based on real-world ROI calculations. 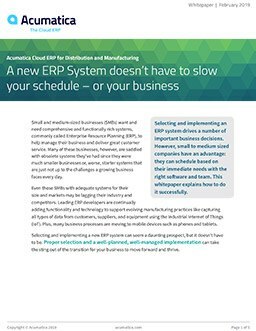 SMBs looking to implement a new ERP solution will find the research company’s insights into Acumatica cloud ERP helpful as they compare available options on the market. Corroborating his statement, he summarizes the key announcements made by Acumatica’s executive team during the Day One and Day Two Keynotes at Acumatica Summit 2019. They include Acumatica’s expanding VAR and ISV partnerships, a continued focus on Acumatica Construction Edition, the new Cegid partnership, and the usability/functionality improvements made to Acumatica 2019 R1. Acumatica cloud ERP users will find the report’s details about what they can expect from Acumatica in 2019 (and beyond) enlightening. For example, Lippincott highlights Acumatica’s push to utilize data services like Power BI and Tableau, as well as emerging technologies such as Artificial Intelligence and Machine Learning (and through them, Natural Language Processing (NPL) for Acumatica’s help queries) to eliminate repetitive manual tasks. That manufacturing customer was not alone in his assessment. Lippincott notes that Acumatica users strongly believe in the product’s capabilities, and Acumatica Summit 2019 assured them that Acumatica is dedicated to not only being at the forefront of technological innovation but also to keeping customer feedback and input at the center of Acumatica’s product roadmap. For anyone who missed Summit, the two Keynotes are available to watch online. A blog post fully recapping the event is also available, offering further details on many of the announcements noted in the Nucleus report as well as some of the exciting futuristic demos presented during the event (e.g. Amazon Alexa for Business and Microsoft HoloLens). Nucleus Research’s new report, Acumatica Shows No Signs of Slowing, is a great read for businesses interested in learning more about Acumatica’s innovative technology, from our cloud ERP software to our modern xRP platform. With 88% new revenue growth and 1,200 new customers in 2018, Acumatica is doing exactly what Lippincott says it is: not slowing down. Contact our team with any questions, to request a demonstration, or to offer your feedback.